You might need a magnifying glass to see these pictures. 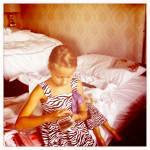 Ryan counting her money to spend at American Girl! More pictures to follow as soon as I figure out how to make them bigger from my iphone!